To help define exactly what I mean by umpteen, let’s begin with the outside. Like theiPhone 5, the latest iPod touch is taller than the previous model—measuring 4.86 inches versus the 4G iPod touch’s 4.4 inches. It’s also quite thin at just 0.24 inches thick. And, like the iPhone 5, it’s surprisingly light when you first pick it up. (Though taller than the previous model, it’s almost half an ounce lighter.) A couple of family members picked mine up unbidden and their first remarks were “Wow, it’s taller… and lighter!” So yes, you can feel the difference. I also found picture taking more comfortable on this taller iPod when snapping shots in landscape orientation. With the older iPod, my hands felt too close together and, invariably, a finger would stray in front of the lens when holding the iPod with the Volume buttons facing up. I didn’t have that problem with the new iPod. My hands spread out a bit more and either because of the weight, the iPod’s dimensions, or a combination of the two, it felt easier to hold the camera and snap the shutter with the Volume Up button. The 5G iPod touch benefits from some features inherited from the iPhones 4S and 5. Delve into the Camera app, for example, and you’ll spy the HDR and Panorama features found on the iPhone. Siri is also on board this latest iPod, and it works just as well (and I’ll let you be the judge of how well that is) as it does on the iPhone—provided, of course, that you’re connected to a Wi-Fi network. (The iPod touch lacks cellular connectivity, making Siri useless when you’re out and about.) The latest iPod touch also has an LED flash next to the camera on the back. The 5G iPod touch ships with a variation of Apple’s new EarPods headphones. What makes them different is the lack of an in-line three-button remote control. And that’s too bad. It’s not that the EarPods that contain this remote sound any better. The touch is one of those iPods that cries out for a remote, as many people keep their iPod in their pocket or purse, with the headphones trailing out. And with Siri now part of the package, we’re more likely than ever to talk to our iPod. The last iPod touch didn’t merit anything other than the bare-bones headphones and, in Apple’s eyes, this one apparently doesn’t either. I disagree, and think it’s a bad move on Apple’s part. We reviewed the EarPods separately and I have little to add other than that they fit my ears far better than the original white Apple earbuds. And like our reviewer, I found their sound okay, but not great. The 5G iPod touch packs two better cameras than its predecessor, and it shows. The new iPod clearly outshoots the old one. The fourth-generation iPod touch held a 0.7 megapixel camera capable of shooting 1280 by 720 (720p) HD video and 960 by 720 stills. The front-facing camera offered a bare 0.3 megapixels at a resolution of 640 by 480. The new iPod touch houses a 5-megapixel rear-facing camera that shoots 1080p HD video and still images at 2592 by 1936. The front facing camera shoots stills at 1280 by 960 and video at 1280 by 720. But the improvements are far greater than resolution. The new iPod’s camera reveals far more details, is better in low light, and its color accuracy is a big step forward. The old iPod’s camera tended to drench images with a blue hue and produces very grainy results in low light. Indoor skin tones are warmer with the new iPod, whereas with the 4G iPod they tend toward pink. The flash isn’t a great help in very low light. It can produce results good enough to embarrass your friends on Facebook, but otherwise tends (like the iPhone) to blow out subjects in a dark setting. It’s better to reserve this feature for fill-flash when you want to brighten up backlit subjects who are standing in a reasonably bright environment. The one wholly new feature on the iPod touch is the wrist strap and the accompanying spring-loaded post for attaching it. Flip the iPod over and you will find, in the lower left corner, a silver disk a little smaller than the head of a thumbtack. Push on it and it pops out slightly. In this position you can slip on the included color-coordinated wrist strap that allows you to dangle the device from your wrist, purse strap, or belt loop. The strap seems plenty sturdy, and I can see it helping to prevent iPods from taking a deadly tumble. It’s something I’m unlikely to use, but Apple makes it easy to ignore. Just leave the post pushed in and treat it as a decoration. Those seeking the legendary “iPhone without a phone” are as close as they’ve ever been to an iPod touch that matches the capabilities of Apple’s mobile phone, but there are important differences outside the device’s ability to make and receive phone calls. It holds no GPS circuitry so Maps’ turn-by-turn powers are lost on it. And because it can’t communicate over a cellular network, FaceTime conversations are, of course, limited to Wi-Fi. I mentioned that Siri is dead unless you’re connected to a Wi-Fi network. This seemingly introduces a problem that didn’t exist on the previous iPod touch—spoken music navigation. On the 4G iPod touch, you could press and hold the Home button to initiate voice control. With that control you could tell the iPod what music to play, which was very helpful while driving. If you have Siri switched on, voice control doesn’t work unless you’re connected to a Wi-Fi network. So, if you’re on the road and want to tell your iPod to play a song, you can’t. However, there’s a way around this. Go to Settings > General > Siri, and switch Siri off. Now when you press and hold the Home button, the old Voice Control feature appears, allowing you to play music by command even when not connected to Wi-Fi. One other thing that’s missing is a $199 price tag on one of these iPod touches. 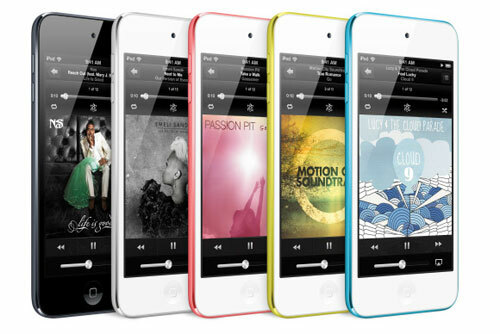 Apple continues to sell the 4G iPod touch in two capacities—16GB for $199 and 32GB for $249. The 5G iPod touch is available in 32GB and 64GB capacities for $299 and $399, respectively. With its new look and continued appeal to younger users (and the parents of these users who’ve relied on avoiding a two-year iPhone commitment for their kid by slipping an iPod touch under the holiday shrubbery instead), that $100 difference may be significant. $200 isn’t cheap, but $300 may be something of a stretch. And frankly, once a kid lays hands on this new touch, they’re unlikely to leap for joy when they unwrap the older model. Change your view of what a computer can do with the VAIO Flip convertible touch PC. Its lightweight, innovative design instantly goes from laptop, to tablet, to viewer mode with a simple flip. Laptop mode features a backlit keyboard and a large clickable touchpad, perfect for working on excel spreadsheets or typing up your latest story. Flip it into tablet mode for quick, convenient access to apps, photos, music and more. Touch, tap and slide your way through the web, or grab the optional Active Pen to write notes and even draw on the screen. Reverse the screen to face outward when you want to watch movies, share your screen or just as a tablet with a convenient stand. Available in three sizes (13.3″, 14″ and 15.5″), VAIO | Flip PC features a Full HD touchscreen display, 4th gen Intel® Core™ processors, optional SSD drive and optional NVIDIA® GeForce®dedicated graphics. VAIO Paper is a digital notebook and handwriting app that replicates the feeling of natural writing with pen and paper. Using VAIO Paper, you can write on your VAIO PC with your finger or the optional Active Pen to add images and sound that enhance your creative writing and express yourself in ways that you can’t with just pen and paper. It’s easy to use, organize and share your creation via email and other apps. See an image on the web that would be a great addition to your presentation? Use VAIO Clip to trace or draw a freehand outline using the Active Pen accessory or your finger around the image. With intelligent and automatic edge detection you can quickly crop images in seconds. Then save the clip in the file manager which will automatically store the creation or modify date, the web page URL and tags, too. Quickly scan, archive, edit and share documents with the CamScanner app and rear camera on VAIO | Flip 13. Simply snap a photo of a document, letter, bill or even notes jotted on a whiteboard. From there, the image can easily be sent to a note app to edit or add comments of your own. You can also import photos from other sources such as a smartphone or camera and adjust them with CamScanner. Looking for something in particular? Conveniently search for archived files using OCR technology. It recognizes text within PDF documents saving you the hassle of searching through them one-by-one. With Sony’s own Rapid Wake technology, you never have to shut down your computer again. Whether you are done working for the day or just heading out to get some coffee, simply put the PC into sleep mode. Then, when you’re ready to start again, resume in two seconds with your data safe and secure. If you are unplugged, don’t worry about draining your battery. Your PC can stay in sleep mode for days2. Snap a self-portrait or video chat online – even in dimly-lit rooms thanks to VAIO | Flip PC’s front-facing HD web camera featuring an Exmor R® sensor. Want to take photos and shoot video of the world around you? Select VAIO | Flip PCs feature a rear 8MP camera powered by a Sony Exmor RS® sensor that captures a crisp, bright picture, even when the light is less than perfect. ClearAudio+ mode allows you to effortlessly enjoy audio quality that is distinctly Sony. One simple operation activates the perfect sound settings for your music and video. With Sony’s unique sound processing technologies you will hear dynamic bass and soaring highs with less distortion for an unmatched music and movie experience. Effortlessly share to Near Field Communication (NFC) enabled wireless devices with a simple touch. It’s all about wireless sharing that’s so easy, anyone can do it. Share and display websites from your phone on your VAIO laptop. Stream your favorite playlist to a wireless speaker instantly. Take connecting with friends to the next level by sharing web addresses with one touch to their smartphone. NFC makes it all possible, with more fun and less hassle. Boot up faster, launch apps quicker and enjoy enhanced overall performance with cutting edge SSD (Solid State Drive) technology on select models. And of course, since SSD includes no moving parts, you’ll get a more durable storage solution less prone to physical damage. From keeping your computer in tip-top shape to creating virtual masterpieces, VAIO PCs come pre-installed with helpful software made for getting things done. Keep things running smoothly with VAIO Care™ software – one press to the ASSIST button can effortlessly manage software, identify problems, perform maintenance and more. Create virtual masterpieces with ArtRage® Studio software. 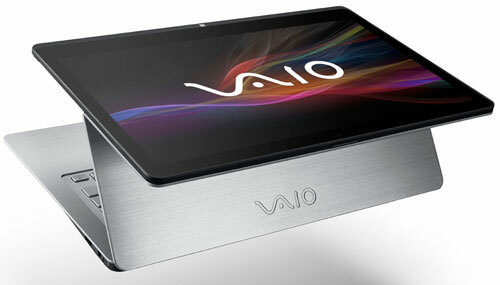 Preinstalled on all VAIO touch laptops, its easy-to-use interface puts the fun at your fingertips. Or inspire your inner artist with Sony Imagination Studio™ VAIO Edition – a suite of three powerful creative software applications that comes with select VAIO laptops. The iPad Air isn’t a radical break from the iPads before it. It doesn’t watch your gestures or read your fingerprint. But its slimmer build gets it that much closer to the dream of the sheet-of-paper-thin form factor where the hardware disappears, and all that’s left is magic. The Air isn’t magic, of course, but pair it up with some of the many spectacular third-party apps available for iOS, and it’s a step on the path. And like its predecessor, it’s our Editors’ Choice for large-screen tablets. Considerably smaller and lighter than any previous iPad, the Air measures 9.4 by 6.6 by a razor-thin .29 inches (HWD), with a much slimmer bezel on the sides of the screen. (That doesn’t affect usage; the iPad’s touch screen still has excellent thumb rejection.) Tuck the Air into the corner of last year’s model, for instance, and the fourth-generation iPad shows 3/4-inch of bezel off the right side. This iPad also has a flat back, not a convex one like previous models. It comes in Silver (with a white front) or Space Gray (with a black front). At almost exactly a pound for the Wi-Fi model and a hair heavier (1.05 pounds) for the LTE version, the Air isn’t feather-light. There are lighter large tablets; the Amazon Kindle Fire HDX 8.9 weighs more than two ounces less, for instance. But it’s airy enough that throwing it into your bag and carrying it all day doesn’t faze you, when it might have with older iPads. Otherwise, this tablet looks a lot like an iPad. Pretty much all the buttons and features are in the same place as on last year’s model, although the volume rocker has been cracked into separate up and down buttons. I have mixed feelings about the bottom-ported stereo speakers. If you’re listening to music with the iPad flat on a table, it’s much louder than competing tablets with back-ported speakers. But if you’re playing a game or video while holding the tablet in landscape mode, all of the sound pumps out of one side. The 9.7-inch 2,048-by-1,536 IPS LCD touch screen is bright, but rather reflective. At 264 ppi, it’s at the limit of my eyes’ ability to distinguish the pixels. It doesn’t quite match 2,560-by-1,600 super-sharp tablets like the Samsung Galaxy Note 10.1$547.99 at BuyDig.com, but I don’t think anyone will be dissatisfied with the sharpness here. The new MIMO antenna improves Wi-Fi reception with the right router. (Yes, Apple’s Airport Extreme fills the bill.) Against an 802.11n Meraki MR16 router connected to our corporate line, I was able to get 30-33Mbps down on the iPad Air versus only 17-18Mbps down on last year’s iPad. That will make a big difference when downloading movies or large files; many high-end games are now over a gigabyte. Both the Wi-Fi and cellular iPads pack Bluetooth 4.0; only the cellular model includes a GPS radio. 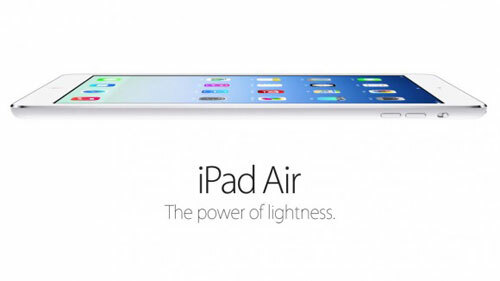 Apple says the iPad Air should last up to 10 hours on Wi-Fi. That’s on a 32.4 watt-hour battery as compared with the previous iPad’s 42 watt-hour cell. In our battery test, which plays a stored video with the screen turned to max brightness, the Air got 6 hours, 14 minutes. (The difference between our result and Apple’s estimate is the screen brightness setting; halve the brightness, and you’ll easily hit that 10 hour mark.) That’s 37 minutes longer than the third and fourth-generation iPads, which had a larger battery, but not as long as the Samsung Galaxy Note 10.1, which scored 7 hours, 37 minutes on the same test. Apple’s A7 processor, running at 1.4GHz here, is the most efficient on the market, although it isn’t quite the fastest. If you want a true deep dive into Apple’s unique chip architecture, which ARM has said is at least six months ahead of its competitors, check out AnandTech’s review of the A7. I’m going to focus more on real-life performance. And that performance is excellent. On the iPad 2 and 3, iMovie in iOS 7 feels genuinely gummy. On the Air, it feels effortless. High-end games like Asphalt 8 and Infinity Blade III render beautifully. Augmented-reality apps update their screens in real time. Yes, there’s only 1GB of RAM on board here, but iOS doesn’t tend to need a lot of RAM because it doesn’t do a lot of multitasking. We ran a range of cross-platform benchmarks and some iOS apps to illustrate how the Air compares with other top tablets. For Web browsing, the combination of the A7 and Apple’s Safari browser is killer: The iPad outmatched every other tablet we’ve tested on the Browsermark Web browsing benchmark. When I say that, I’m also including the Intel Bay Trail-based Asus Transformer Book T100, which didn’t score as high. On the GFXMark benchmark, which gauges gaming performance, the A7 pulled 49 frames per second onscreen, which competes well with, but doesn’t top Nvidia Tegra 4 and Qualcomm Snapdragon 800 tablets. On the Geekbench processor benchmark, quad-core processors like Qualcomm’s Snapdragon 800 beat the dual-core A7, but that’s to be expected. Geekbench scales more smoothly with more cores. If you’re just comparing the Air with other iPads, of course, there’s no contest. I got 13 percent higher Browsermark results than the fourth-generation iPad, and 35 percent better than both the iPad 2 and 3. Graphics frame rates were more than double the iPad 2 and 3. A short 720p movie exported from iMovie in 41 seconds, which is 50 percent faster than on the fourth-gen iPad and three times as fast as on the earlier models. iOS is still a simple grid of icons that is passionately focused on touch. Read our in-depth iOS 7 review if you want the full details. Apple’s obsession with touch has resulted in some amazing apps and new ways of doing things, from interactive textbooks to Square’s credit-card processing app. It falls flat for me in only one area, but an important one: traditional productivity. Apple’s Pages and Numbers, while now free with new Apple hardware, are just too visually oriented for a procedural thinker like me, and none of the third-party alternatives measure up to Microsoft Office on Windows tablets. As you may know, I am no fan of people who take snapshots with their tablets. I think they look like idiots. But as Apple reminded me, that doesn’t mean there are no good uses for tablet cameras. The iPad’s 1.2-megapixel, 720p front camera works well for video calls, and the 5-megapixel, 1080p rear camera plays a role in scanning, shopping, and augmented reality apps. The Camera app is notoriously simple, with your options limited to HDR, Panorama, Square, or Standard. Samsung’s Galaxy-device kitchen sink camera this ain’t. The main camera is quite sharp, with a super-quick shutter and good low light performance. It blows out bright skies, which the HDR mode didn’t fix, and shutter speeds flirted with blurring moving objects on a cloudy day in my tests. But take it out of the realm of snapshots and into computer vision, and it’ll be able to recognize things well, especially with an excellent, fast-focusing macro mode that excels at reading text. Video shot in 1080p ratcheted its frame rates down a bit in lower light, from 30 fps outdoors to 27fps inside. The front camera takes 1.2-MP still shots and records 720p video at 30 frames per second in good light and a very grainy 24 frames per second in low light. Most notably, like all iPad cameras (but unlike, say, the Kindle Fire’s) it’s designed to work with the iPad in portrait mode, and the angle and focal length are perfect for video calling in that orientation. If you hold your iPad in landscape mode, you have to angle it oddly to get your face in the picture. The iPad Air comes in 16, 32, 64, and 128GB models, starting at $499 and adding $100 each time your double your capacity. The 128GB tablet has 115GB free for your files. Multimedia playback is the same here as with other Apple mobile devices. Natively, the tablet plays anything you sync over from iTunes, whether via USB cable or Wi-Fi; there are (paid) third-party apps to handle music and video formats that the integrated players don’t support. You can throw your video over to a TV using a Lightning to HDMI adapter cable ($49) or wirelessly with Apple TV£77.27 at amazon.co.uk. If you need a notebook with a large display, Acer’s V5 is a well-priced solution. Just don’t expect knock-your-socks-off performance. The Acer V5-552G-X414 is an all-purpose laptop that looks nice, boots fast, and delivers more than enough everyday performance for the average user. It renders movies smoothly on its 15.6-inch, 1366-by-768-pixel display, and it plays a good game up to a resolution of 1024 by 768. The keyboard is better than average, but the touchpad isn’t a favorite. 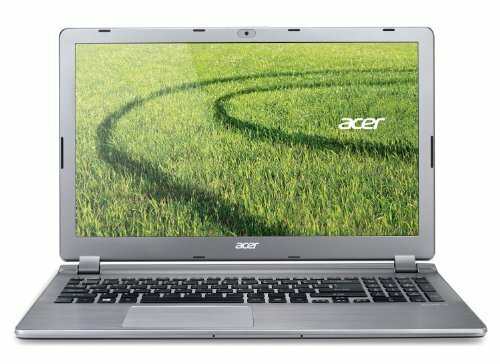 The Acer V5 weighs 4.41 pounds—just over 5 pounds when you add its AC adapter—and is handsome in a minimalist fashion. Our test unit appeared entirely in slate gray except for the black keys on its short-throw keyboard—one of the better keyboards I’ve tried (if not quite up to Lenovo or recent Dell quality). The one-piece rocker-style touchpad, on the other hand, while nicely responsive to movement and taps, bends far too much before registering clicks. It feels odd and sours the overall ergonomic experience. Also, where many laptops provide access panels for the memory and storage, the V5 does not. This makes upgrading a sticky wicket for the average user. The $630 configuration Acer sent is built around an AMD A10-5757M CPU, with integrated HD 8750M graphics. Throw in 6GB of memory and a 5400-rpm, 750GB hard drive, and you have a notebook that scored a pedestrian 124 on PCWorld’s Notebook WorldBench 8.1 test suite. Subjectively the unit feels snappy enough while on AC power, but less so when it’s trying to preserve battery life. Most of our test games, however, were playable at 1024 by 768 resolution, which isn’t something we can say about all laptops in this class. Booting up is quick (about 18.5 seconds), 1080p video renders smoothly, and the sound through the speakers is better than average. Battery life on the PCWorld rundown tests proved to be a decent 4 hours, 13 minutes. Not stellar, but workable. The V5 has all the ports and connectivity options the average user is likely to need. On the right side are the headset jack, SD card slot, and a single USB 2.0 port. The left has only a single USB 2.0 port and the power button. The back has a USB 3.0 port, an ethernet jack, and both HDMI and what Acer calls a converter port. The converter port offers VGA connectivity via a $25 dongle. The V5 also features 802.11 a/b/g/n and Bluetooth 4.0+HS. The Webcam is a 720p model that delivers a smooth picture. Acer ships the V5 with a fair amount of software on board. Some of it is welcome, including the company’s own recovery-management utility, a button to make up for Windows 8’s missing Start menu, Nero Backup Essentials, and Dolby Home Theater to perk up the sound. But you also get a lot of useless bloatware, such as links to Netflix and eBay. You’ll want to spend some time identifying and removing junk that might spawn unneeded background processes and sap the notebook’s performance. The Acer V5-552G-X414 is a viable everyday laptop, and it’s more than viable when it comes to playing movies and low-resolution games. But the bendy feel of the touchpad continued to irk even after I’d had a few days to acclimate to it. And the inability to easily access the hard drive or memory stymies one of my usual suggestions for most users, which is to go cheap on the CPU and upgrade overall performance with an SSD (a component that’s not available as an option at the time of writing). Both Apple’s and Google’s flagship devices of 2013 are out in full force. In one corner, weighing in at 3.95 ounces with a 4-inch display, we have the iPhone 5s. And in the opposite corner, coming in at 4.59 ounces with a 5-inch display, we have the Nexus 5. Both phones are the flagships for iOS and Android, respectively, and as we go into the holiday shopping season, we’ll see what phone becomes the top seller. If you’re someone who’s still deciding on which one to get, we’ve decided to give you a direct comparison between the two devices, as explain some of the bigger differences between the Nexus 5 and the iPhone 5s. We’ll also talk about some of the shared qualities between the two as well, which might make the decision process even more challenging, but hopefully we can help you make the right decision for you. 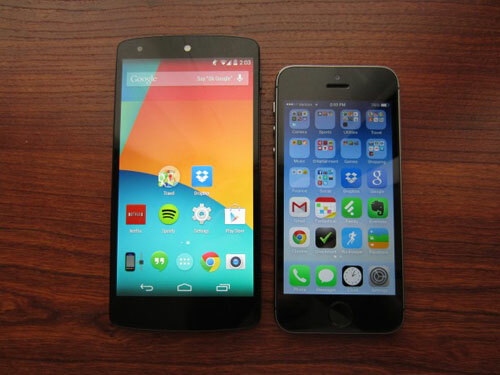 Obviously, one of the biggest differences between the Nexus 5 and the iPhone 5s is the size. The Nexus 5 is slightly larger than the iPhone 5s, and that’s mostly thanks to the inch difference in screen size, where the Nexus 5 sports a 5-inch 1920x1080p display and the iPhone 5s has a smaller 4-inch 1136×640 display. A lot of power users love the bigger displays, but if you’re like me and want a more portable device that fits better in your hand, the iPhone 5s is the winner in this category. However, the Nexus 5 really isn’t all that much bigger than the iPhone 5s. Photos will make you think otherwise, but holding a Nexus 5 in your hand will most likely have you questioning how Google managed to fit a 5-inch display in such a small handset. Speed is pretty important; apps need to open quickly and navigating around your device should be smooth and snappy. As far as pure numbers go, the Nexus 5 absolutely demolishes the iPhone 5s with its quad-core processor clocked at 2.3GHz, compared to the iPhone 5s’s dual-core 1.3GHz A7 chip. Of course, though specs aren’t everything, and you’d be surprised how fast the iPhone 5s, thanks to its extremely-optimized iOS 7 operating system. If you’re a numbers guy and need the phone with the fastest processor, go with the Nexus 5, but you likely won’t be able to tell a difference in real-world speed between the two handsets. This one’s a tie for the most part. The Nexus 5 runs Android 4.4 KitKat, while the iPhone 5s runs iOS 7. Obviously, these are two completely different operating systems, and your decision will most likely come down to which platform you prefer. These days, it’s all about the ecosystem and what platform offers the best apps and overall better experience. Ultimately, it comes down to whether you like Android or iOS, rather than the decision coming down to which specific phone you like better. But whichever platform you pick, you have an excellent phone waiting for you to buy that will give you the best possible experience on its respective operating system. The camera is one of those features that many users are picky about. A lot of people want a phone that can replace their traditional point-and-shoot cameras, and from our experience, the iPhone 5s can do exactly that. Since the Nexus 5 was just recently launched, we haven’t gotten the chance to thoroughly test out the camera, but from our experiences so far, the Nexus 5 is capable of delivering some great photos and video. However, the iPhone 5s comes with Burst Mode that can shoot 10 photos per second, and a Slo-Mo feature that records video at 120fps. These features alone can be the icing on the cake for someone looking for a handset with a good camera. Battery life is one of those things that no one is ever happy with. With that said, you might be pleased to know that the battery life on both the Nexus 5 and the iPhone 5s are pretty decent. According to Apple, you’ll be able to get 10 hours worth of LTE surfing time, while Google says that the Nexus 5 will last seven hours on LTE. Of course, your mileage will vary, and each user will have their own experiences as far battery life goes, but it’s usually a safe bet to knock a couple hours off of what companies give you as far as battery life numbers. Here’s where boys become men and girls become women. When it comes down to it, the cost of a device is the ultimate deciding factor, and difference in price between the Nexus 5 and the iPhone 5s is substantial. Off-contract, the Nexus 5 starts at $349, while the iPhone 5s starts at $649. Fortunately, you can get the iPhone 5s on-contract starting at $199. The Nexus 5, on the other hand, can only be bought off-contract right now. So, if you’re wanting a contract, the iPhone 5s ultimately wins as far as up-front costs go, but the Nexus 5 is cheaper when buying outright, and essentially, even if you’re on a contract, you’re definitely paying a lot of money over two years, which is far more than just the $199 up-front cost of the iPhone 5s.